A tale of two Hekia Parata speeches. This week is the first week of the term break. Every term break there are teacher only days and planning days and professional learning days and conferences. This week three conferences ran across the week, NZEI's Annual Conference, PPTA's Annual Conference and the School Library Conference (SLANZA). I only found out on Tuesday that there were also conferences running for ERO and PaCT in Auckland as well. So many teachers, principals, support staff and other educational professionals were well involved in many different conferences throughout the land. 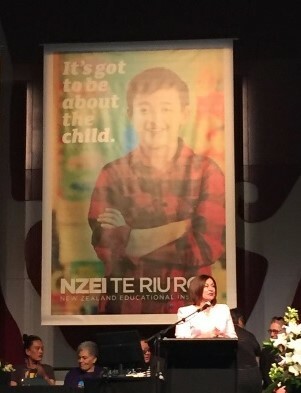 NZEI began its conference entitled It's Got to be About the Child (see the picture on the left to see one of the banners) on Sunday. They had a full agenda planned with different sectors within the Institute demonstrating their year's work and what was to come as well as CTU President Helen Kelly was speaking, Prof Bob Lingard from Queensland as the key note speaker and addresses from the Australian Education Union and Education International. 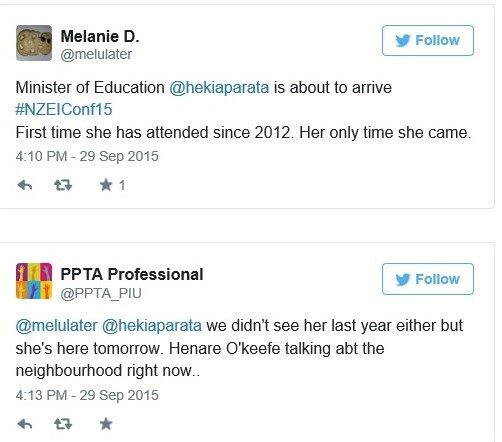 What was of note was our Minister of Education, Hekia Parata, was again not on the agenda. Several weeks ago I had been told she had declined the invitation. While not an official attendee for this year's conference, I decided to gate crash on Monday because of the speakers. I really enjoyed Monday, and was as surprised as everyone when Louise Green stood up before the afternoon session and told the meeting that the Minister's office had rung to say Ms Parata wanted to speak to the membership the following afternoon and was rearranging her afternoon to do so. I was not at the NZEI President's Awards Dinner on Sunday night (obviously), but I was told that Bill Noble, former NZEI President, did comment that previous to the current Minister, all the Ministers of Education of the day had spoken to the NZEI Annual Meeting each year. It was then observed that the invited Ministry official was seen with two phones, and was texting away furiously on one of them. To the Minister perhaps? Join the dots from Sunday night to Monday afternoon. 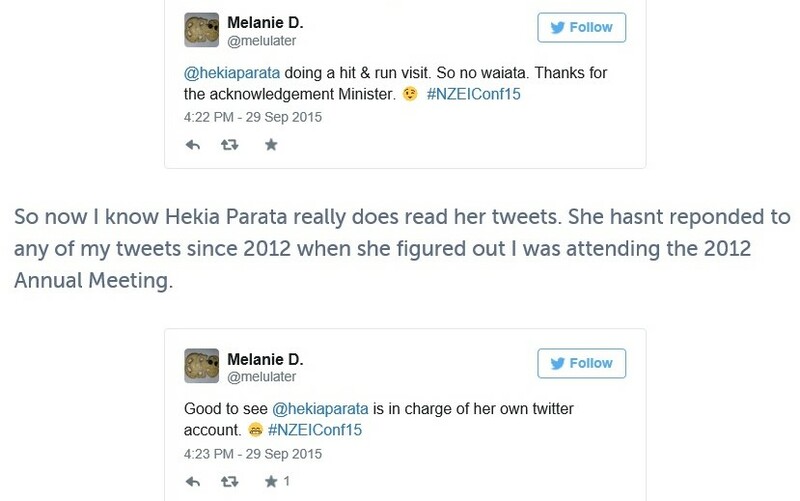 What was interesting was that after her greeting, Hekia address my tweet first. Oops. During the "acknowledgement" of my tweet, the Minister stated that she was supposed to be in China this week on a delegation regarding education or the like. Well I know that Gerry Brownlee was in China on the day, apparently putting a deal about leasing pandas on the table. The Minister also stated that she was going to Finland in a few weeks (here's hoping she actually takes a lot of notice of how they do things there!) and so her office decided she couldn't be out of the country so much, and withdrew her from the China trip. She then claimed that the invitation was not reactivated within her office. Looking at the explanation, then marrying it up with the fact that she had just arrived from two conferences in Auckland that day (the ERO and PaCT conferences), as well as the fact that she had been confirmed to speak at the PPTA conference in the next few days for several weeks... and well... you can see I thought (in polite terms), "CODSWOLLOP MINISTER!!" Anyhow, you can watch the Minister for yourself in this video below. The Minister aggressive at the beginning of her speech. She then whipped through a 17 page speech in 12 minutes. Note the video in 19 minutes long. Ms Parata flung a lot of figures and numbers at us to justify what she has done. Ms Parata also claimed that she wanted to be held to account. That is very difficult if you do not front up to us each year, if you decide to show if three years after your last visit. The Minister did not look at all comfortable with herself in front of the NZEI membership at all during her visit. There were no questions. There was no time for questions. She had arrived at about 4:10pm and had to catch a flight at Rotorua Airport at 5:15pm. Please also watch National Executive Jan Tinetti's response to the Minister. This is very clever and pointed. Below is the Twitter feed from before, during and after Ms Parata's speech as a Storify. 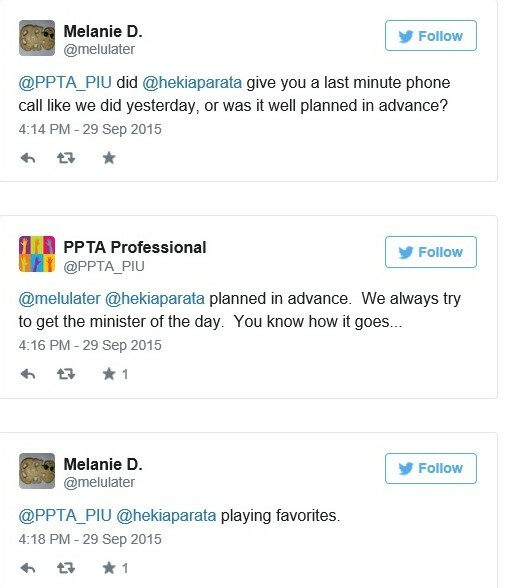 Two days later, Hekia Parata spoke to the PPTA (I hope this embed works!). Her demeanour was more relaxed, comfortable. I wondered if it was because it was a smaller room with less delegates, if the NZEI members are more scary than the PPTA members... She was cracking jokes, spontaneously breaking into te reo (then having to translate when she realised 90+% of the attendees were not fluent bilingually)... it was all going so well until she got to answer a question on charter schools. Watch and see... by the way this video is an hour long (if it is working). On the plus side, at least Hekia Parata can remember her stance on the 1981 Springbok Tour, unlike the Prime Minister. These articles were pretty much the first lot of press she had gotten since the 22 of September. The Minister said that there would be targeted PLD in reading, writing, maths, science and digital fluency along with a pilot for PE and health (note that National killed all the effective PLD in these areas in 2009 when they introduced the flawed National Standards and focused all PLD on implementing that very badly). This PLD would be targeted at the regions with "consistently poor achievement data" - that would be Northland and Gisborne/East Coast schools - because "as tax payers we should be very concerned" that the current PLD has been ineffective. To me that means that the Minister will be interfering directly in these schools with how they run and dictating what they do. 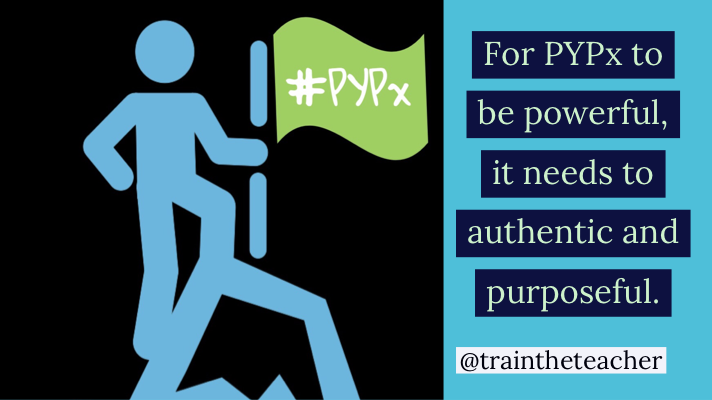 Where is the flexibility and collaboration in that? While more PLD would be welcome, the Minister's signal that the Education Council (aka EDUCANZ) will most likely be responsible for this signals more warning lights. It raises questions over the flexibility of PLD to meet the needs of individual teachers and schools, centralising education functions (after 26 years of decentralisation) and the ability the Education Council to administer and deliver PLD. The Government did not want to fund schools according to their raw results in National Standards or NCEA, but on how much teachers had helped students to learn over the course of six months or a year, "the consistency and the progress". "You've got to work out which school is delivering achievement, which schools are focusing on how they raise the quality of their teaching and leadership practice, and how is that translating into kids demonstrating that they're learning more?" To hear Hekia come out with comments on this during her speeches worries me. Angela Roberts from the PPTA was pointed in her reply to the Minister after her speech that the four meetings a year with the Education Forum the Minister established was not enough to collaborate and consult with the schooling sectors on how funding will work. I agree. I think John's Blog 8 Predictable Outcomes of Hekia's Planned Funding Changes alerts us to why the Minister's ideas on school funding are so flawed. The Minister has said that children are not mentioned at all in the Education Act previously, that is keeps tripping her up (which means the Act is stopping her from completely destroying our quality public education system), and that she wants it to be child centric and all in one easy document. Great - just make sure that there is full and proper consultation with the sectors and all stakeholders. And listen and use it. Don't ignore us like you did with the Teachers Council!! 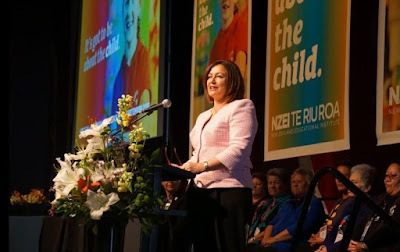 Ms Parata acknowledged to the NZEI Conference that we had concerns over ECE funding being frozen. She then proceeded to tell us how much more money is being spent on ECE now than in 2009 and that 98% of providers were meeting the standards. What the Minister failed to consider was, that while more money is going into ECE, more children are participating in ECE and the funding per child has not increased. Also, minimum standards does not necessarily equate to quality in ECE. She did not address that. Support Staff did not even rate a mention with the Minister. The Minister congratulated both unions on their participation with the MOE over IES/Joint Initiative. But there was a smugness in how she gushed over the 31% of members who voted to return a 78% Yes vote for the Joint Initiative to go ahead. NZEI has ceded all the power they earned in their rejection of IES in 2014 by taking the pig with lipstick that the Joint Initiative became after the negotiations with the MOE to the members and getting them to vote for it by saying it was the best we would get. Jan Tinetti did acknowledge that the members were uneasy over the Join Initiative developments. I'd say the members are furious. I know I am, and this decision has meant I will not return to classroom teaching next year because I will not be party to the GERMification of our education system. NZEI threw out the inoculation to the GERM by presenting this vote to the membership. I know the Joint Initiative team put in a lot of hard work. They collected a lot of data, examples and information that will continue to be useful in many ways. But I consider what was put up to the membership to be an insult to their hard work. I see the Community of Schools/Community of Learning model to be the vehicle to controlling what is taught and how, introducing and embedding PaCT in schools (because Hekia waxed lyrical on how it would make our workload better - yeah, right), bringing in super principals and replacing BOTs for each schools with Boards covering the cluster. Just a few predictions. I'll be devastated to see them come to fruition. 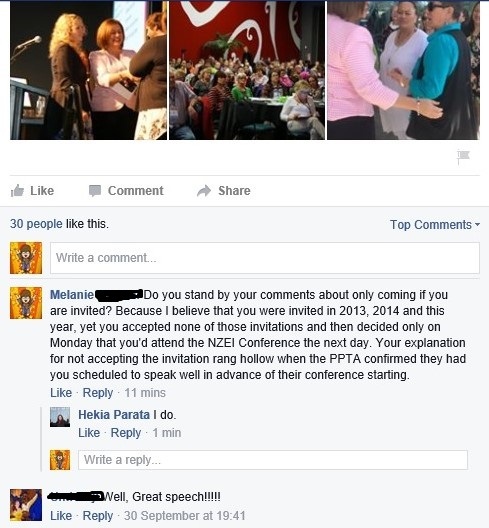 As stated above, Hekia said she would attend if invited. She said that at the NZEI conference, and the PPTA conference, but her tone of voice inferred she had not been invited. After the Minister left, last year's invitation to the NZEI Conference and the rejection from the Minister's office was put up on the big screens. A comment was made as to "I don't know what goes on in the Minister's office but she is invited every year." Today I challenged Ms Parata directly on her Facebook page about what she said in regards to invitations to conferences at the NZEI and PPTA conferences. Her response was quick and concise. I believe that this Minister of Education is incredibly dangerous. What she has done, along with what Anne Tolley did before her (and she was a shocking Minister of Education too), and what Ms Parata is about to do will be devastating to our quality public education system, and too much of it will be irreparable if we don't stand up as NZEI members to stop her from implementing even more flawed right wing neo liberal policies. If we don't, then we have failed the standard as professionals of the education sector.